Quincy granite gave rise to the nation’s monuments. Now there’s a push to give it, and those who worked it, their due. A group of Quincy residents is pushing to build a Quincy quarry and granite workers museum, saying it fears a big piece of the city’s history will be lost unless action is taken to preserve it. Quincy was once known as the Granite City. Its quarries produced stone used in many of the nation’s public monuments; grand public buildings from the Palmer House in Chicago to customs houses in Boston, Savannah, and San Francisco; lighthouses such as Minot’s Ledge Light; and fortifications such as Fort Warren in Boston Harbor. The West Quincy pits mined for the hard, handsome stone used in the Bunker Hill Monument in the 1820s initiated a 140-year run of quarrying in the Blue Hills, providing stone-cutting work for immigrants from Italy, Ireland, Sweden, Germany, and Finland. The Bunker Hill Quarry, among the West Quincy pits, provided the impetus for the nation’s first commercial railroad, the Granite Railway, which ran 3 miles to the banks of the Neponset River, where stone was carried by water to Charlestown to build the monument honoring the Revolutionary War battle. 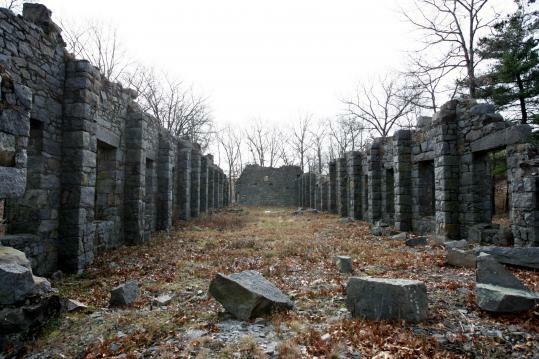 Testifying to its national importance, the quarry site where proponents plan to locate the Quincy Quarry and Granite Workers Museum has three listings on the National Register of Historic Places: its Granite Railway terminus, the Granite Railway incline, and the Lyons Turning Mill. But official recognition has not been followed by action. Funding for a museum was supposed to be part of the deal when the city agreed to lease land in Quarry Hills to the Granite Links Golf Club 17 years ago, but no financing emerged when the deal took its final shape, said Alfred Bina, president of the museum group. Today the quarries are visited primarily by rock climbers, and the pits are covered by graffiti. Some of the quarries are on state park land. The state created a Quincy Quarries Historic Site trail in the area 20 years ago, but the trail markers have fallen into disrepair because of the state’s chronic underfunding of its parks. “This part of Quincy’s history is being lost to future generations,’’ the museum group warns in its mission statement. The city of Quincy has been slow to act on a museum, agrees Vic Campbell of the Massachusetts Bay Railroad Enthusiasts, a group of railroad history buffs who spoke about the beginnings of the Granite Railway at a meeting held in October by the museum group. “It seems that when it comes to the Adamses, nothing that anyone can think of is too much. When it comes to the quarries, nothing is too neglectful,’’ Campbell said. While city officials agree a quarry museum would be a plus for the city, creating one has not been a priority for recent administrations. Mayor Thomas Koch said last month the plans for a quarry museum were in the hands of Bina’s citizens group. The nation’s large-scale granite quarrying industry was born here in 1825, when the architect who submitted the winning design for the Bunker Hill Monument - Solomon Willard - selected West Quincy as the source of stone for the memorial. Quincy’s granite was selected for its hardness and durability, dark color tone, and ability to take a high polish. Needing a great deal of stone to build the 220-foot obelisk, Willard developed new construction techniques that turned the local granite into a practical building material. As demand for Quincy granite grew, quarrying developed into a thriving industry and played a significant role in the economic and social development of the area. More than 50 quarries operated in Quincy, employing thousands of workers over nearly a century and a half. Quarrymen split granite with hand tools such as chisels, wedges, and drills before the introduction of steam drills in the 1880s. The lengthy Bunker Hill construction also ushered in the first true commercial railroad in America. Engineered by Gridley Bryant, whose innovations are still in use in railroads elsewhere, the Granite Railroad made it possible for horse-drawn cars to carry tons of granite over the rails at a rate of 5 miles per hour, on a route similar to that of today’s Southeast Expressway. The railroad’s construction and engineering techniques were studied by engineers and investors from around the country who sought to bring the new means of transportation to their own states. The group pushing the museum wants to build it next to the remaining walls of the Lyons Turning Mill on Quarry Hills Drive, Bina said. Once the best-equipped mill in New England for turning and polishing 22-foot columns and 6-foot granite balls, the structure was 200 feet long and housed a huge derrick to move stone. So far the group has collected donated tools, photos, and lots of historical information, said Bina, a retired chemical engineer with West Quincy roots who described himself as a “rookie’’ in the area’s quarry history. Incorporated a year ago, the Quincy Quarry and Granite Workers Museum is registered with the state as a nonprofit group and is in the process of applying for federal nonprofit status. Acquiring federal status as a 501(c)(3) tax-exempt organization is needed to draw corporate donors and allow the group to begin serious fund-raising, Bina said. For more information about the museum project or membership in the group, go to its website, quincyquarrymuseum.org, or call 617-472-1322.